Men and women have totally different ways to pack for their honeymoon, as the humorous video above points out. Nonetheless, there are some rock solid honeymoon packing tips that apply to both genders. TIP #1: Be sure to label your luggage on the inside and out. Even more, make your bags standout with a unique, colorful luggage tag so it is not mistakenly taken by someone else with a similar bag. Don’t let missing luggage slow down your honeymoon! 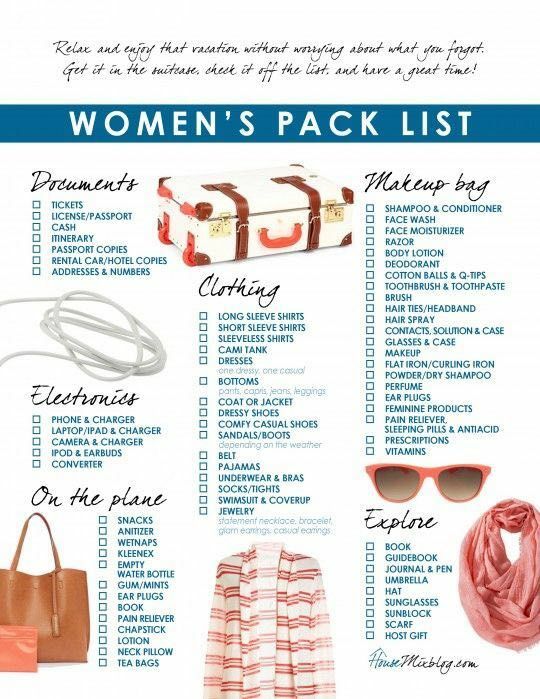 TIP #2: Create a packing checklist. It’s just as easy to overpack as it is to forget critical items. Checklists make packing more efficient and less stressful. By the same token, checklists reduce your risk of leaving items behind at the end of your honeymoon. I’ve attached a real, nice checklist for women I found from a website at www.HouseMixBlog.com to get you started. √ RECYCLING: Instead of bringing 8 tops and 8 bottoms for 8 days of travel, try bringing half that amount and then mixing and matching outfits. It will help you feel like you are wearing something new without adding bulk and weight to your bag. √ ACCESSORIZING: Adding scarves and jewelry to simple outfits is the another way to increase your travel wardrobe. A bright blue scarf and some fun earrings will make a black dress look different than it does with only a simple belt and a simple chain necklace. √ Airline tickets or e-ticket confirmations. √ Credit cards. Leave behind those you don’t need. √ Photocopies of everything listed above. Make 2 sets: one to carry with you; one to leave behind in your hotel. √ Phone #s for your doctor, credit card companies (in case they’re stolen), and house and pet sitters. TIP #5: Carry key items on the plane with you, such as medications in their original bottles, tickets, itineraries, emergency contact info, change of clothes, and a few fun and light items, like magazines, e-books, or playing cards. These simple tips will help you relax and enjoy your honeymoon all the more! Congratulations … and bon voyage!